In Scotland, 100,000 ballot papers were spoilt in last night’s elections. This has been blamed on the layout of the ballot papers, and also on the Scottish Parliament and local council elections being held at the same time, each with a different ballot paper and voting system. 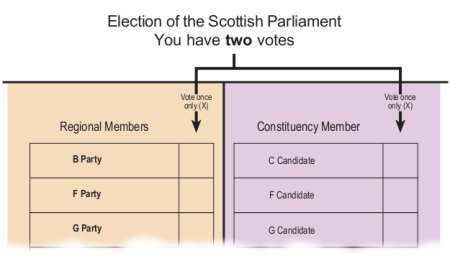 The ballot paper for the Scottish Parliament looks simple enough to me, it even has concise instructions printed on the paper. Two votes, cast by placing one cross in each of the two columns. The local election, which required voters to rank candidates in order of preference, also gave instructions on its ballot paper. Yet not only did people vote incorrectly, they apparently also mixed up the two papers, despite them being clearly labelled – even if someone was unclear as to how to go about voting on one of the papers, the fact that instructions are printed on them should prevent people from mixing the two up. Isn’t it interesting that, even if someone seems incapable of following simple instructions on a ballot paper, we still consider them capable of making an informed decision when it comes to voting in an election, with all the complex issues that there are to understand? On the other hand, perhaps some people simply couldn’t be bothered to take the trouble to vote correctly. It’s all very well blaming the system, but I think the voters should take some of the blame too.